8am – This service follows the Book of Common Prayer, using either Rite 1 or Rite 2. The service generally runs about 50 minutes. 9am – Join us for a new kind of church: an all-ages service of singing, prayer, storytelling and communion in the Parish Hall. We welcome the presence of energetic and wiggly babies, toddlers, young-‘uns, and the grown-ups who accompany them. 10am – A warm and welcoming traditional service with organ and choral music. The service runs about one hour and fifteen minutes. Nursery Care – During the 10am Sunday services, we offer nursery care for children ages 4 and younger. Paid staff caregivers and parent volunteers help provide a welcoming and loving environment for your children while you worship. Parents have the option of having their children brought into the church for Communion. Sunday School – For children in Kindergarten through grades 5, we offer a rich and nurturing program of Christian formation every Sunday morning beginning at 10am. Learn More. Middle and High schoolers have their own program: Learn More. Acolytes – Acolytes play an important role in assisting with and leading the 10am service. It is also a great opportunity for young people to experience the service from the altar side of the worship. Children and youth from 10 years old through high school may serve as acolytes. Please email Rev. Chris to discuss serving. Yoga St. John’s We offer weekly yoga for all levels with live music and candlelight and a daily reflection/meditation. For the next 40 days, we will focus on exploring Lent. Every Monday, 6:15-7:30pm in the Parish Hall. Suggested donation of $10-20. Learn more here. The Christian Meditation Group gathers in the chapel every Tuesday at 7:15am for a service of prayer and Christian meditation. All are welcome – beginners and longtime practitioners! Questions? Email the group leader here. Dinner Church . . .There’s a place for you at our table. Deepen your faith, build community, and dine on a delicious homemade four-course dinner. So check out Dinner Church, every second and fourth Tuesday in the Parish Hall from 6pm to 8pm. Come to eat, share your stories, love and be loved. 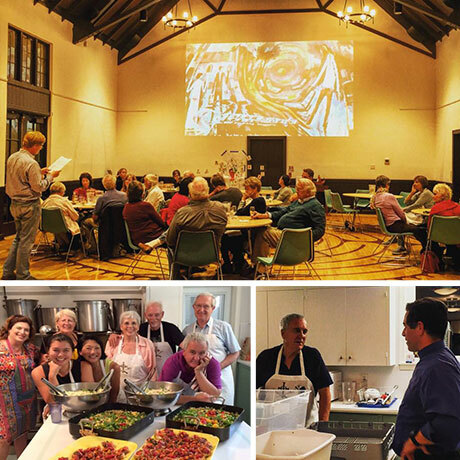 If you want to cook with us, contact Virginia Kosydar, Church Administrator via email or at 415-456-1102, x102 to sign up. Join us in the kitchen and/or at the table! Noon – This service is celebrated in the Fireside Room and includes the Eucharist, laying on of hands, healing prayers and is followed by a light luncheon in the Parish Hall.